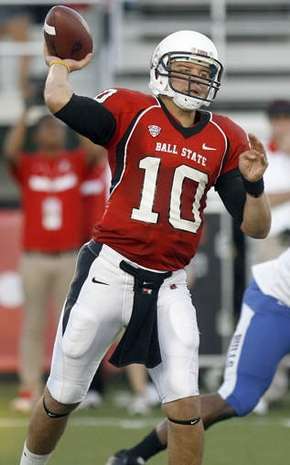 It’s never been said that the NFL was anything close to easy or fair, and I’d say with the news out of Baltimore that Keith Wenning has been released by the Ravens, that point just hits closer to home than usual for Ball State fans. After being a 6th round draftee last spring, Wenning spent the 2014 season on the practice squad while the Ravens carried only two QBs on their game day roster. With the offseason pickup of Matt Schaub, Keith’s window was slowly closing. Compounding that fact was undrafted free agents that the Ravens needed roster space and dollars for, so Keith was shown the door. From all accounts around the Ravens and the Wenning camp, Keith certainly was working like an all-star, frequently the first in and last out of workouts and practices. That should come as no surprise to BSU fans, and neither should the universal praise of Keith as a person and player. It’s a harsh reality that often times in the NFL, and any for profit business for that matter, sometimes hard work, attitude, and skill pale in comparison to money and numbers. A harsh reality but a reality all the same. In my heart, I know that this is the start of Keith’s journey and nowhere close to the end. Of the myriad players I’ve had the opportunity to interact with and chat with over my time covering Ball State, none have been as humble, sincere, and just all around decent, the way that Keith was. Whether it’s football, business, or just life in general, Keith will be tremendous and a tremendous representative for Ball State and its football program. Philosophically, though, it is somewhat disappointing that players like Keith struggle to make it in professional sports while countless headcases, discipline problems, and legitimate delinquents make roster after roster. Something isn’t right with that situation.